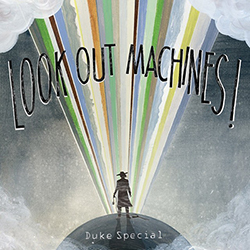 ‘Look Out Machines!’ sees Duke exploring new musical ground with collaborators including Iain Archer, Phil Wilkinson and Gary Clark and heralds the return of an artist back at the very top of his game; a major difference between his recent output and this album is that, for the most part, Duke has placed himself in the first-person with these songs. The obvious result is a more personal album. Yet as vulnerable as he may be, the spectacular ‘In a Dive’ betrays his inner defiance. “‘I refuse a safety net,” he croons over a beautiful, elegant piano riff, while the sweeping, elegiac ‘Domino’ draws the album to a close on a redemptive note.